If I remember correctly, Buffaloes don’t have wings, right? However, what’s the scoop on these spicy, delectable bite’s origin? There is some dispute about who came up with the original hot wing appetizer, but most credit the Anchor Bar in where else but Buffalo, New York. The historic creation date for Buffalo Wings was October 30, 1964, when owner Teressa Bellissimo was faced with feeding her son and his friends a late snack. 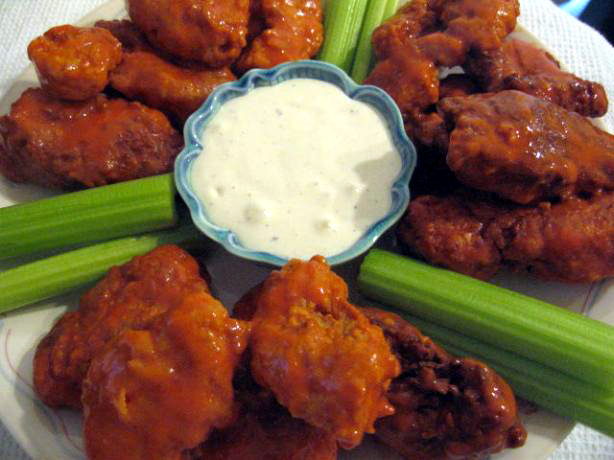 Having an excess of chicken wings on hand, she fried up the wings, dipped them in a buttered spicy chile sauce, and served them with celery and blue cheese dressing as a dipping sauce to cut the heat. The wings were an instant hit. The city of Buffalo has designated July 29 as “Chicken Wing Day,” and today, the Anchor Bar serves up more than 70 thousand pounds of chicken per month! The Anchor Bar original recipe for hot sauce is now sold commercially. Enough history, fast foreword to today’s healthy minded diner who refuses to compromise flavor. These boneless Buffalo wings are made with healthy white-meat chicken, they’re usually deep-fried and drenched in hot sauce laced with butter. The solution: chicken tenders are dredged in seasoned gluten free flour and cornmeal, pan-fried in only a small amount of oil and then drizzled with a tangy hot pepper sauce. With a fraction of the fat, calories and sodium, these boneless wings are reason enough to throw a party. Perfect for the upcoming Super Bowl Festivities! To prepare dip: Whisk sour cream, blue cheese, 1 tablespoon vinegar, lemon peel and 1/4 teaspoon cayenne in a small bowl. Cover and refrigerate until ready to serve. Remove chicken from the marinade and roll in the flour mixture until evenly coated. (Discard remaining marinade and flour mixture.) Sprinkle both sides of the chicken with 1/2 teaspoon cayenne. Ingredient note: Chicken tenders, virtually fat-free, are a strip of rib meat typically found attached to the underside of the chicken breast, but they can also be purchased separately. Four 1-ounce tenders will yield a 3-ounce cooked portion. Next Post The Best Thick Bold Rich Game Day Chili: Think Hot Dogs, Fries or Straight Up! Love the name Bellissimo, but is it really 70,000 pounds of chicken wings a month?? Thats around 3 ounces per wing, so 6 into 1,120,000 ounces = 186,666 chickens a month, or 2 1/4 million birds a year, just in one shop! In Asia they eat chicken feet, heavily spiced, as you can imagine. Personally, I can leave them.